The most talented intuitive readers come here to find their next job. With this simple job posting, you’ll be sure to find your next super performer! Includes one standard job post for 2-weeks. 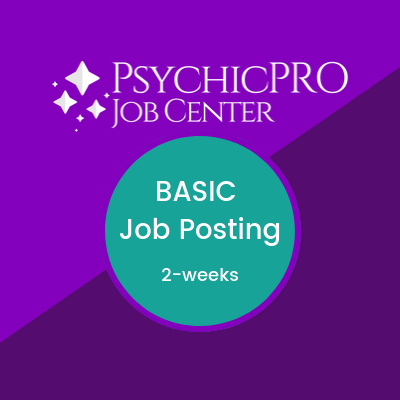 This package provides you with (1) Two-week Job Posting on PsychicPRO Job Center. This is the perfect solution for any company or recruiter working on a budget. Find the next super performer for your telephone, video, text chat or other psychic / lightworker position. After we receive your information, we’ll review your posting and publish it within 24 hours. *please note: If we need to verify the accuracy of any information in your posting, we’ll contact you using the information you provide (email and phone#). This could delay the publication of your posting, depending on how long it takes for you to respond. Thanks for understanding. We’ve been helping lightworkers find employment for nearly two decades. Our job listings get viewed by lots of potential talent! 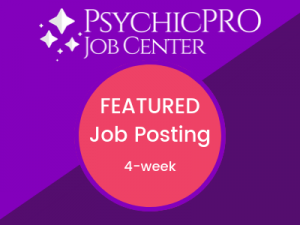 Your ad will be listed with jobs viewable on the PsychicJobCenter.com website, provided by PsychicPRO. The listing will be refreshed every 2-weeks as long as your ad is active, moving it to to the top of the list. We’ll alert our subscribers who have requested to be notified about jobs like yours. We’ll include your job post in our weekly newsletter, sent to all of our subscribers, for as long as your listing remains active. 4. Receive Applications and Hire Your Next Reader! An email will be sent to you with all of the candidate’s information, including their contact information. You’ll have an online report where you can login and view all your applicants. This information is only sent to the email address you provide and is not shared with anyone else. OR, if you prefer we can send applicants directly to your own online application, anywhere on the internet. Your listing will be live for 2-weeks. At the end of the 2-week period, you’ll be able to choose to renew your ad. If you do not renew it, your ad will expire and no longer be viewed. With this job ad, you’ll also have access to the full database of online resumes. These are uploaded by psychic lightworkers who are serious about finding work as telephone, video, chat, etc. readers. Contact information provided. Save time and hire top readers immediately! You can make changes to your job at any time. Please allow us upto 1 business day to process edit requests. We’ll keep your data on file for 30-days. After that time, applications are scrubbed from our database. Make sure you keep your copy that gets emailed to you when the candidate completes the application. If you choose to have candidates re-directed to your own application, we will be unable to provide you with your online report. It is your responsibility to review your ad after is live. We cannot be held responsible for any errors. Please make sure to report any errors / edits immediately so we can fix them. 1. The Type of Position must be disclosed. It’s okay to post listings for employees, independent contractors, limited engagement, or business opportunities. However, you must be truthful in your classification. 2. Posting must be relevant to the Lightworker community. This covers a wide variety of jobs, especially because our community is interested in building independent income. The most popular jobs on our board are for providing readings. 3. Compensation Details must be disclosed. It’s okay if you pay by the minute or by the hour. Or if you pay per task or by commission. However it works, you must disclose, truthfully, the compensation details. 4. Only legitimate opportunities please. This should go without saying, but we’ll only accept listings for legitimate income opportunities for psychic lightworkers to provide their services in return for compensation. 5. No ORANUM listings please. We already work with the best recruiting team in the USA for Oranum jobs. In order to avoid the confusion of having multiple recruiters hiring for the same job, any listings ordered for a position on Oranum will be rejected. Thanks for understanding. A Featured Listing will provide your job openings with even more visibility, leading to more applications. If you have an ongoing need for top-quality psychics to staff your service, this is the best option.